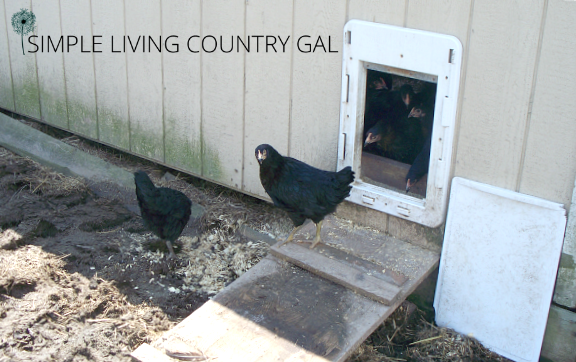 It is important when choosing what to house your chickens in that you pick a place that you will not outgrow too quickly. 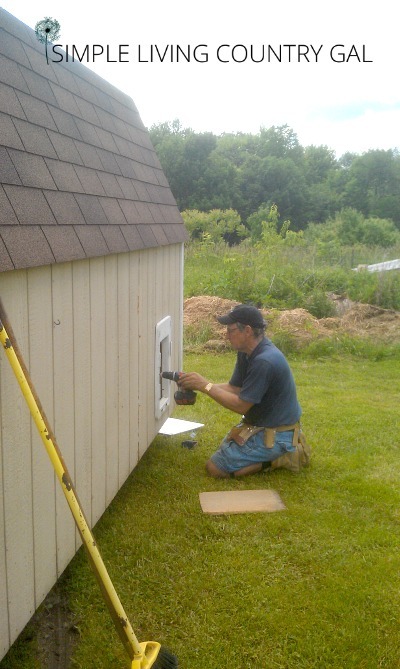 This post will walk you through how to convert a shed into a chicken coop. Raising chickens is an addiction. Sure you start out with two or three, but then before you know it you have a whole flock running around your yard. If you want to let your hens free range, you need to be careful where you put your coop. Chickens poo, a lot and they do it anywhere they want without any concern for us barefoot walking people. In no time at all, walking through the grass is like navigating a minefield especially if you are in bare feet! So choose carefully…that is all I am going to say on that. Ahem. We used to house our pigs in a 10 x 13-foot shed, but as we soon found out raising pigs is an addiction as well and we outgrew that shed rather quickly. The good news is I could use the shed as our new chicken coop. The bad news is it was in the wrong spot and needed to be moved to the other side of the property. That task alone was a day-long event. Actually, all in all, the whole project took a week. One day to “de-pig” the shed (AKA, shovel, hose, scrape, hose, sweep and hose once more), one day to move it, one day to build the inside pen and two days to build the run. Luckily the cost was minimal. $25 in lumber and $15 in chicken wire. The rest of the materials we had on hand already. I pride myself in repurposing anything and everything I can. To me, functionality is number one rather than looks, much to Handy Man’s dismay. So back to the topic. I like to do things in steps and I think it is easier to read them that way as well. 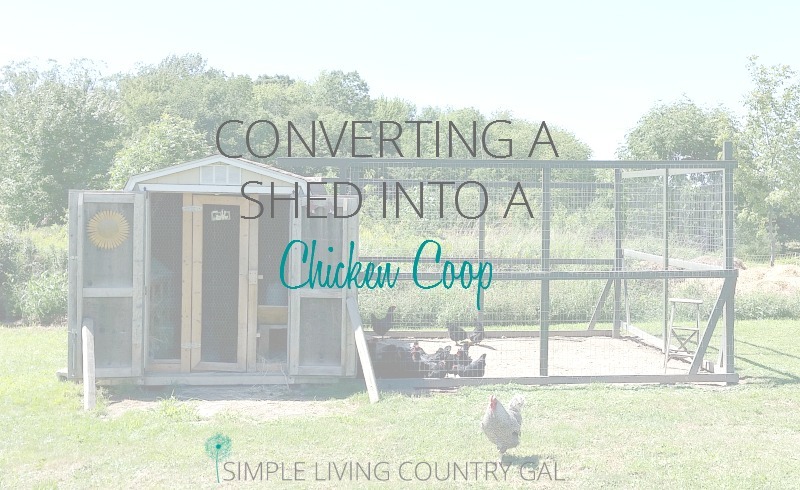 Step by step guide to converting a shed into a chicken coop. Step #1. Pick the perfect spot for your coop because you won’t be moving it anytime soon! 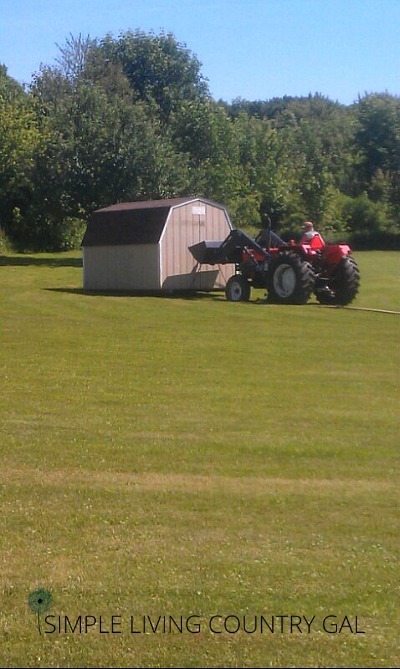 First like I said we needed to move the shed to the other side of the property. Handy Man was in charge of pulling with the tractor while his brother repositioned logs underneath the shed to help it move easier and do less damage to our yard. Somehow I think Handy Man got the easier part of this job. Let me stop here to say that choosing the right spot took DAYS to decide. I knew I had one shot here, there was no way Handy Man was going to move that shed a second time. I finally decided to put the shed in-between the garden and the barn was the best spot. If you are new to chickens then I suggest you read my post on how to raise chickens next to your garden before diving in. Chickens can quickly and quite efficiently destroy a newly planted garden in record time so taking precautions is advised. With that being said, chickens are a dream at breaking up a garden in the spring so for that reason alone I like them to have easy access. Okay, back to the shed. 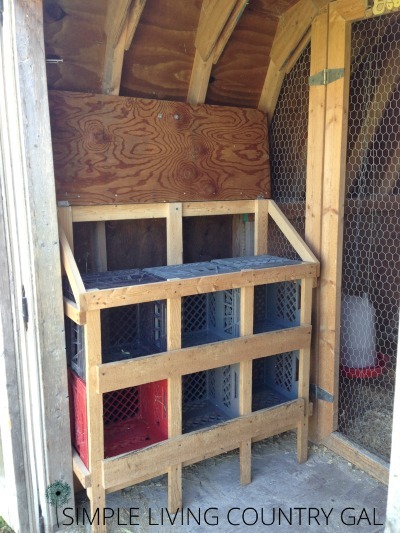 When you set up your coop you need to make sure you have room for a roost, feeder, water, and nesting boxes. If it allows I suggest an area for storage to make feeding time easier but this is not necessary. Once we had the shed settled in its spot, my wonderful father who was visiting us on vacation stepped in to do the interior renovations. He built a framed wall with a door that was all covered in chicken wire. The outer area is usually where I keep the bedding and feed, but right now it is housing my older hens at night while the babies are in the coop and run. NOTE: We have since extended the inside of the coop since our flock doubled in size. (see I told you, addiction). When you build your coop it is important to make sure you have enough room for all your birds to prevent hen-pecking. Step #4. Have safe access to your outside run. 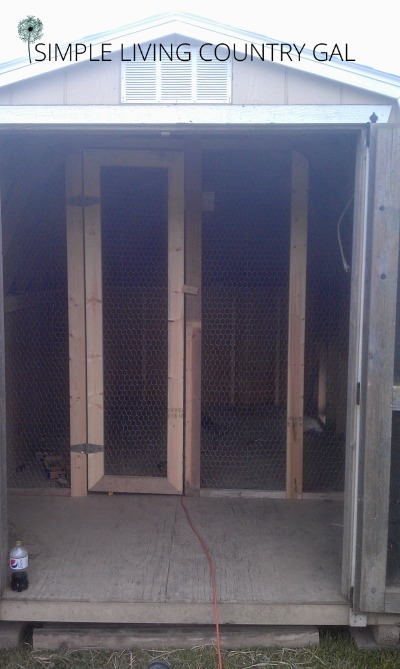 The next step was to get a door in for the chickens to access the outside run. Hubs happened to have a doggie door in the basement that would work perfectly. I have no idea why he had this, but I don’t ask I just use! My dad cut a hole in the back corner and installed the doggie door. I must say it works perfectly! Step #5. Put in your nesting boxes. I suggest doing this first since your nesting boxes are going to be the biggest item in your coop. When placing them it is important that you chose the best spot for them. Keep it away from drafts and off in a corner if possible. I like to keep mine close to the door so it is easier to collect eggs. Want to make your own? You can see how we did it using what we had on hand. How to Build Your Own Nesting Boxes. Step #6. Add some roosts for your chickens. Next, we needed to build and install our roosts for our hens to sleep on at night. We built two with scrap pieces of wood both that are ladder-shaped and hold the girls quite well. You can read all about chicken roosts here for tips on spacing. When I am feeding in the mornings the birds on the top rung of the ladder roost jump down to eat their grain and I have been landed on too many times to count. So, there’s another tip for ya! Step #7. Hang your water and feeder. I highly recommend hanging both your waterer and your feeder. This really cuts down on waste. Chickens like to scratch all the time and all that bedding can get tossed into their water or feed. If you hang it up it helps keep things clean. In the winter I prefer to use a water bowl. You can see why in How To Winterize Your Chicken Coop. Step #9. Build an outdoor run. Even if you plan to free range your chickens I still highly suggest you build a run as well. Chickens still like to be outside at dusk and dawn when it’s starting or still is dark. There are quite a few predators out at that time so having a safe outdoor chicken run for them to browse in is a good idea. Make sure to include access to the run from outside. Our run needs maintenance quite often so easy access is key. Step #10. Bring in your chickens! At this point, the birds could be moved in until Handy Man could build the outside run. They were quite happy with their new digs and quickly made themselves at home. 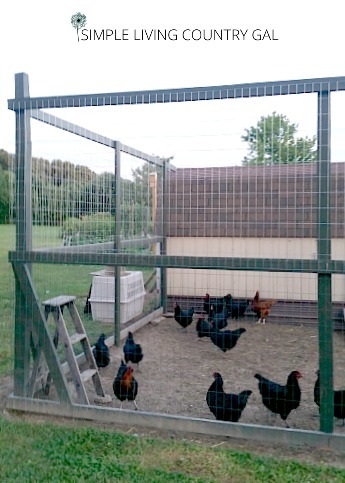 Chicken Wire – Be sure to get a good sturdy wire that will keep your chickens in and predators out. Plastic Chicken Waterer – This one works great if your weather is mild. Metal Chicken Waterer – Better for winter months. Chicken Feeder – This feeder works great and will last the longest. Bedding – I prefer wood shavings because it really soaks up the moisture. 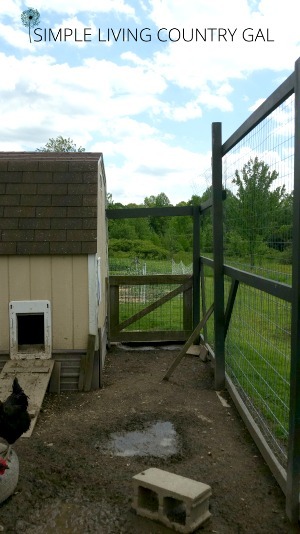 Doggie Door – A great way to let the chickens in and out quickly and easily. Thank You So Much!!! This is just what I was looking for!! And hopefully soon will be able to start my flock!! Awesome article. I can’t see but am assuming there is a door to the run? Yes there is on the back side. I went out and got a picture this morning so you can see. It was raining so the coop is a bit of a mucky mess! It is a half door with fencing above it. We need to duck down to get in, but this keeps the birds from getting out. This is great. What are you doing for water. Or did I miss it? For right now we use a rubber dish for water. I simply have it up on a cinder block. One in the coop and one or two outside in the run if it’s really hot. We find it so much easier to use the dishes. Simple to change the water (just dump and refill) and easy to clean plus 1/3 the cost. I water all 50 of my chickens this way! We are moving to an acreage in the coming weeks and so excited to start our chicken adventures! I love the design of your coopand run-just a question. Inthe picture under number 5, it looks like the gate and chicken wire interior wall are set into the shed with the nesting boxes outside the gate. But in the end picture, it looks like the gate/wall are right at the shed entrance and the nesting boxes are now inside. Am I looking at it wrong? Any help is appreciated as we prepare to build ours again, I love your design. Thanks! Wow, you are observant! 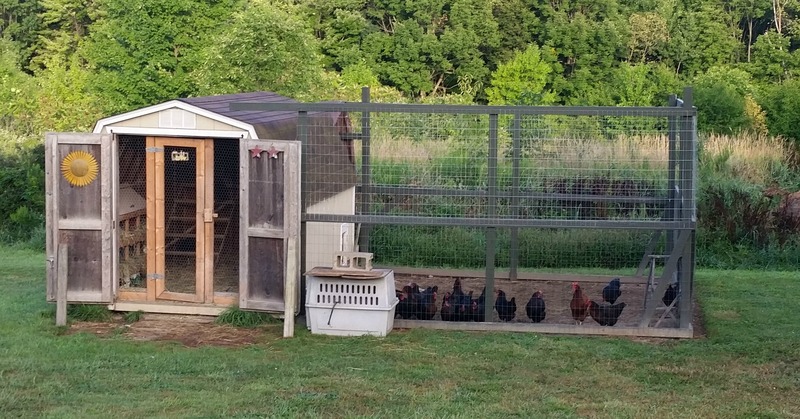 Yes, we needed to expand the coop when we increased our flock so there are two different pictures. I found early on to have MORE room than suggested for your hens. Hen pecking can be a terrible thing to break in a flock so try not to give them a reason to start. Plenty of room to roost is also important. with Hawks or Owls? 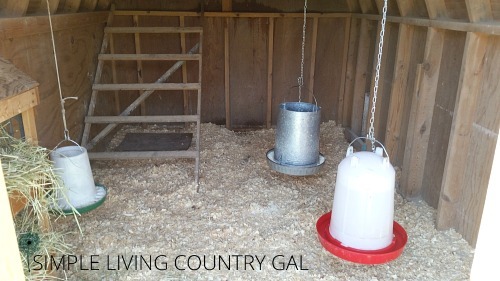 I really like the way you have things set up inside of the coop and hanging the food and water makes sense. We do not have the top covered, and luckily we do not have problems with owls and hawks. We are just lucky I think, since we do have quite a few here. I am sure having a rooster helps with this since he alerts us(and our poor neighbors) to anything that is out of the ordinary. It looks like you live some place that is warm. I live in Ohio. Did you, or would you recommend doing something to keep them warm in the winter? Actually, I live in Northwestern Pennsylvania! The only thing I do to keep them warm is make sure they are able to get out of the elements, shovel them a dry patch each morning in their run, and make sure they always have fresh water and food. Chickens are pretty durable if they are healthy and given time to adapt to the cold and I have not found the need to do more for them. Now, if the temps get really cold like negative 20’s like we can get at times, I will bring in some hay and put it in the coop so they can snuggle down in if they need to. Do you ever close off access to the chicken run? Or are they free to go back and forth from the Coupe to the Run as they please? I close them off the run from dusk until dawn. During the day they have access to the full run. There are too many predators that could hurt/kill our chickens so we lock them up at night to keep them safe. Thank you for this article. We are thinking of doing this! Do you close the main solid shed doors at night? Thanks for sharing! Yes, I do close things up and night. We have weasels and other predators that it is important that the girls are safe while they are sleeping. Even though the run is enclosed we still do not give our hens access after dark. Just found your site: LOVE this article! I can’t wait to explore more! How many chickens does an average wood shed house? A chicken requires between 2-3 square feet inside of a coop and 1 square foot each on a roost. Our shed is pretty large, 8 x 10 feet so we can house about 20 hens. If you free range your birds you can get away with a bit more since they tend to be inside so little. Hi there! This is a great setup. I was wondering how you deal with new chicks and older hens. Do you keep them separated until they are all the same size? 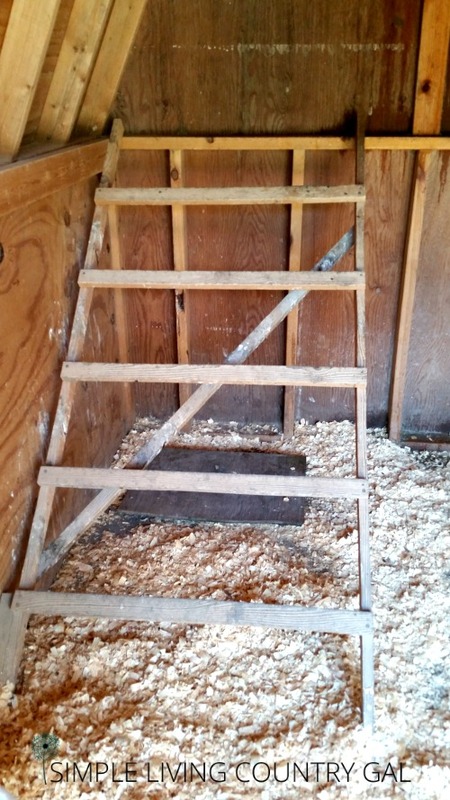 I am trying to redesign our coop, which is about the same size as yours, to perhaps accommodate a separate area for chicks but can’t figure out a good design. Thanks for any suggestions! I like to keep the chicks and hens separate until they are very close to the same size. I then add everyone at night. Just carry them out and put them on the roost. It’s almost funny how the chickens do not even realize that I added anyone new. They are silly! My coop is 8 x 10 and I have 23 chickens inside. The rule of thumb is 2-3 square feet per chicken. I have a small run but it opens up into a large fenced in area of about 100 x 160. So they have plenty of room to run! Hi, thanks for the info in your article. I found it helpful. I was wondering how do you clean the inside of the coop? Is it a wooden shed? We’re thinking of using a shed as well but we aren’t sure how we would clean it if it’s wood. We’re pretty new at this and we want to learn as much as possible before getting the chickens. Thanks! I just use a shovel and a wheelbarrow to clean it out. That shed housed pigs for 8 years before we put chickens in and have never had to replace the floor. The key is to not let it stay wet. So I am continually adding bedding as needed, maybe a bucket of wood shavings 2 times a week just to keep it dryer, and that works just fine. You can read how we clean out the coop HERE. Hi, Tracy! I LOVE your coop! I stumbled upon your post by accident through Pinterest and it was nearly exactly what I am planning on doing! My shed is an 8×12, but I am putting up a wall to separate a “feed room” as I saw you had in yours before expanding. I plan to start with 5-10 birds, so hopefully I won’t outgrow this space too soon! I have a question for you, though. 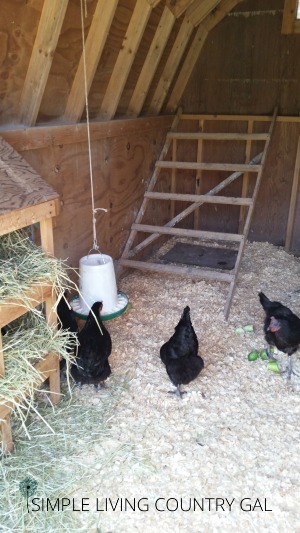 When I decided to convert the shed to a coop, some well-meaning chicken enthusiasts really emphasized the importance of having good ventilation and now I’m a little worried that my shed won’t be ventilated enough to keep my girls healthy! So, since your size and setup is so similar to what I will have, I am wondering if you have had any ventilation problems, or how much ventilation you have? My shed has a vent at the top on each end, and also two windows that can open (which will be covered in hardware cloth, of course!). Thanks for sharing your wonderful setup! I can’t wait to have my own flock! I am so glad you like our coop set up! I have two vents just like you said your shed has, but no windows and my hens have been fine for years. With the windows, you will be fine too! Good luck, let me know when you get your chickens!